First it was teacher to student. Then it was father to son. Now, it’s man to man. 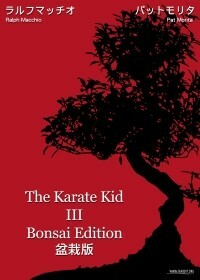 The Karate Kid, Part III has always been considered inferior to the first two films by most Karate Kid fans. 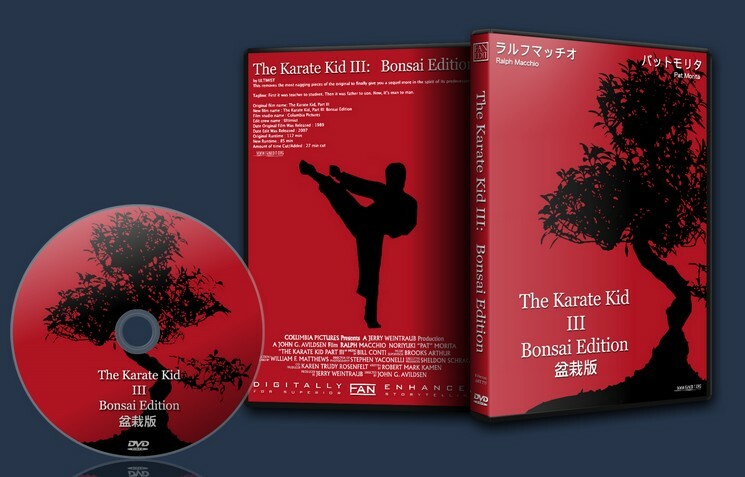 The Bonsai Edition attempts to turn the film into something not only watchable, but more dramatic and entertaining, with new opening titles, removal of the “recap” scenes from the first two films, a vastly changed order of events, and a new ending. A vastly changed order of events, and a new ending. Note: The video is in its original quality. The retail film was on a single-layer DVD5. I am not sure why the studio opted to sacrifice the picture quality of this film. The excessive graininess you will see from time to time is on the original DVD. English only audio track. No subtitles. I apologize for any inconvenience. There are many other minor cuts & edits not mentioned here. I didn’t maintain a comprehensive list of changes as I was editing. I feel that the final product is much better than the original film. I hope you enjoy it. All references to Daniel’s mother have been removed, and her single “telephone call” scene has been edited out. It is unnecessary and sloppy exposition to tell us where his mother is and why she’s not going to be in the movie. We simply don’t care. The scene in question was rather cheesy anyway. I have edited Ralph Macchio’s performance liberally, because there were many instances where his acting was utterly terrible. Now, in the Bonsai Edition, he gives a reasonable performance. Similarly, Thomas Ian Griffith’s performance as Terry Silver had some very corny and “over the top” moments. I have cut such moments to a minimum to make him a much more serious and sinister character. There were many bits of dialogue here and there that revealed the plot far too early, or described something we just saw or heard. Now Silver’s motives are a bit more mysterious, and we aren’t constantly being reminded of what we just saw. Mike Barnes’ performance has been tweaked a little, as well. Small bits of his expository dialogue have been removed, to give the viewer less talk and more action. Pat Morita’s performance as Miyagi is nearly flawless, as usual, so 99% of his dialogue remains untouched. The romance between Daniel and Jessica has been reconfigured so that Jessica isn’t getting back together with her old boyfriend after all. Now there’s a chance she and Daniel might stick together after the credits roll. The order of events has been drastically altered in the first hour of the film, with no continuity issues or plot holes. Certain scenes have been cut entirely, leaving better scenes to adequately explain what’s what and who’s who. The film opens with Daniel and Miyagi, rather than Kreese, to establish our heroes before the bad guys start mucking things up. New music has been added to several scenes that I felt needed some dramatic uplifting. The tournament was probably the most difficult scene to deal with. I decided to leave it largely intact, with a few minor cuts and changes, and a newly added bit of dialogue to motivate Daniel into “the zone.” All dialogue references to “win a point, lose a point” have been removed from the final fight, to perhaps make Barnes appear a bit foolish for losing points just to punish Daniel a bit more.